Documented by mikedaps on 15th March 2010. 1. Five specimens with two near identical 'TBF comm' printed/manuscript completed labels both with collection dates of Aug 1889. First with additional CES annotation correcting identification to Statice binervosa, second with a "Herb Thos Clark (1793-1864)" stamp. 2. Penciled note: "1 specimen given to C E Salmon 24 Feb 1916"
3. 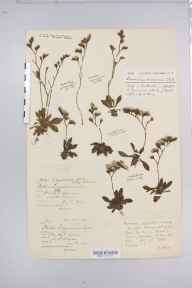 3rd label attached signed by C E Salmon details: "Limonium occidentale,O.Kuntze Very often confused, with spreading spikes, like this, in Cornwall & Devon, particularly in small specimens. Not near "Statice Limonium"!" Penciled annotation above note "= L. binervosum C. E. Salmon"
10/02/2014 tom humphrey Deleted note: 1. Five specimens with two near identical 'TBF comm' printed/manuscript completed labels both with collection dates of Aug 1889. First with additional CES annotation correcting identification to Statice binervosa, second with a "Herb Thos Clark (1793-1864)" stamp. 2. Penciled note: "1 specimen given to C E Salmon 24 Feb 1916" 3. 3rd label attached signed by C E Salmon details: "Limonium occidentale,O.Kuntze Very often confused, with spreading spikes, like this, in Cornwall & Devon, particularly in small specimens. Not near "Statice Limonium"!" Penciled annotation above note "= L. binervosum C. E. Salmon"
10/02/2014 tom humphrey Added note: 1. Five specimens with two near identical 'TBF comm' printed/manuscript completed labels both with collection dates of Aug 1889. First with additional CES annotation correcting identification to Statice binervosa, second with a "Herb Thos Clark (1793-1864)" stamp. 2. Penciled note: "1 specimen given to C E Salmon 24 Feb 1916" 3. 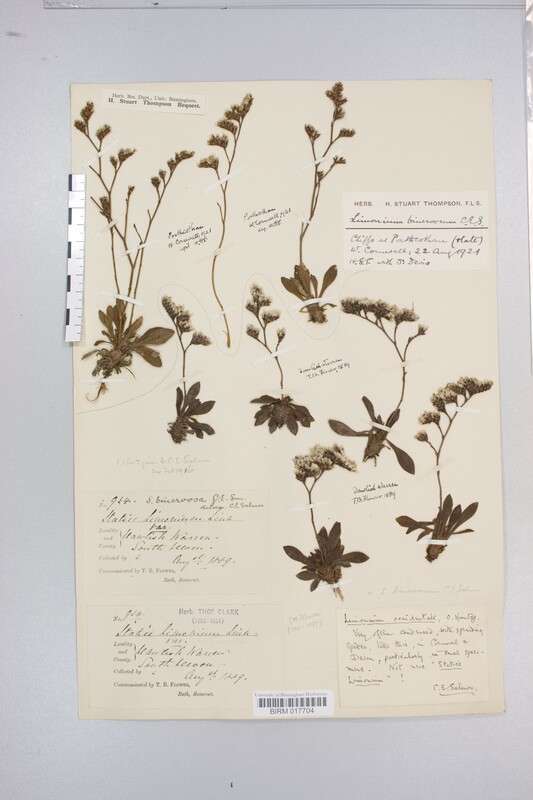 3rd label attached signed by C E Salmon details: "Limonium occidentale,O.Kuntze Very often confused, with spreading spikes, like this, in Cornwall & Devon, particularly in small specimens. Not near "Statice Limonium"!" Penciled annotation above note "= L. binervosum C. E. Salmon"